Stephanie Baghdassarian, research director at Gartner. A recent survey* by Gartner, Inc. reveals that saving time and money are the top reasons why consumers would use artificial intelligence (AI). “AI is among the technologies that consumers consider using for tangible and more ‘serious’ benefits, as opposed to socializing, projecting self-image and having fun — three common reasons for using other personal technologies,” said Stephanie Baghdassarian, research director at Gartner. 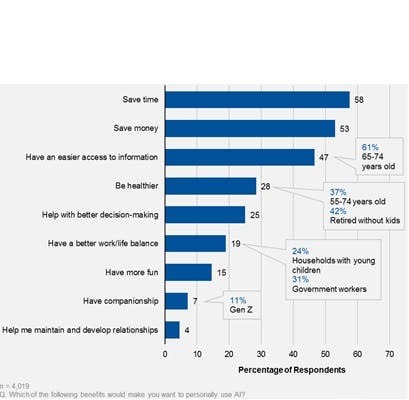 Fifty-eight percent of respondents said they would use AI if it helps them save time by taking over some tasks (see Figure 1). Fifty-three percent said they would use AI if it helps them save money. “We can think of AI being able to look for the best deal for a specific purchase, or find the best route to a particular destination, enabling to save money on toll payments and fuel,” said Ms. Baghdassarian. Forty-seven percent would use AI if it gave them easier access to information, such as travel and transportation directions and details of their everyday consumption of goods. “Consumers are ready for a new relationship with AI technologies, but have clear preferences about how they want that relationship to occur,” said Anthony Mullen, research director at Gartner. The survey also found that more than 70 percent of respondents feel comfortable with AI analyzing their vital signs, and with AI identification of voice and facial features to keep transactions secure. Nevertheless, when it comes to AI examining emotion in voices or facial expressions, 52 percent of respondents do not want AI to analyze their facial expressions to understand how they feel. Furthermore, 63 percent do not want AI to take an always-on listening approach to get to know them better. When it comes to privacy, consumers are skeptical about the use of AI and are concerned about what it may mean. Gartner, Inc. is the world's leading research and advisory company. The company helps business leaders across all major functions in every industry and enterprise size with the objective insights they need to make the right decisions. Gartner's comprehensive suite of services delivers strategic advice and proven best practices to help clients succeed in their mission-critical priorities. Gartner is headquartered in Stamford, Connecticut, USA, and has more than 13,000 associates serving clients in 11,000 enterprises in 100 countries.